Jack knives are small fish that range in size from 6 to 9 inches. 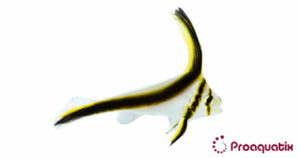 The fish are typically in black and white or in dark brown and white color. Jack knives mostly inhabit in reef areas. Jack knives are spotted on the middle western Atlantic Ocean, to Caribbean, Gulf of Mexico and Bahamas. Usually ignores corals but will eat fishes and other invertebrates.